Whiteford has a long and interesting history as almost anything but a refuge for wildlife. In the past, parts of it have been a quarry; it has been reclaimed for use as agricultural land; sand has been extracted from it; and it has even been subjected to investigation as a site for coal extraction. Today, I am pleased to be able to report, very little of this background is in evidence: Whiteford is a wild and peaceful place full of interest for naturalists of all persuasions. Whether you like birds, plants or just enjoying beautiful countryside this reserve has something special to offer. Whiteford is owned by the National Trust, and the NNR is managed jointly by the Trust and Natural Resources Wales (NRW). From Gowerton take the B4295 to Llanrhidian and then follow unnamed roads to Landimore, Cheriton and Llanmadoc. There is parking available in the Llanmadoc village car park, but if you continue on through to the church and turn right towards Cwm Ivy there is a private car park on the right as you turn down the steep hill. At the time of our recent visit, in March 2011, the charge for this car park was £1 and it was monitored by CCTV cameras. 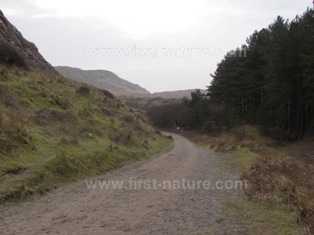 From the village of Llanmadoc it is about a 15- to 20-minute walk in the direction of Cwm Ivy to the entrance to the NNR. The paths within the reserve are reasonably good, but they are not suitable for wheelchair users or for people with prams or pushchairs. 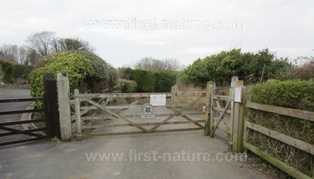 Other than information boards, t here are no facilities at the nature reserve, but there is a village shop in Llanmadoc. A cottage within the reserve is owned by the National Trust, and it is available for holiday rentals. Whiteford Burrows was one of the sites where the Fen Orchid (Liparis loeslii) was recorded in the past, but this orchid has not been seen there for several years and its numbers are declining at its one remaining stronghold in Wales, Kenfig NNR, which is further along the coast in an easterly direction. 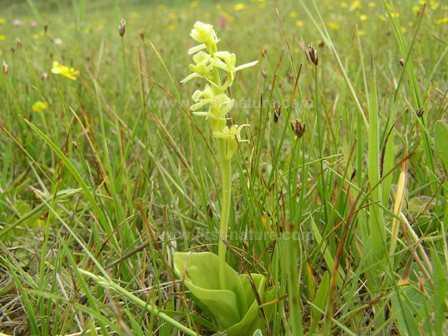 Fen Orchids thrive only in dune systems that are evolving rather than stable. In 2009 a five-year programme was started at Kenfig to provide new habitat into which, it is hoped, the Fen Orchid will extend its territory. June is the prime time for the Fen Orchid to flower. There are, of course, many other kinds of wild orchids and other wildflowers at Whiteford that you can enjoy as you search for the Fen Orchid. The substrate is rich in calcium because of the crushed shells in the sand constantly being blown inland during windy weather, and so the kinds of flowers that grow there are those that we would find in the South Downs and North Downs in England, for instance. The uniqueness of the sand dune reserves in Wales lies in the diversity of species concentrated in what are relatively small areas. There are not many sites outside Wales where you could expect to see up to ten wild orchid species in bloom at the same time. At least 250 species of flowering plants have been recorded at Whiteford, making it one of the richest dune systems in the UK. Special flowers to look out for include Dune Gentians (Gentianella uliginosa) and Petalwort (Petalophyllum ralfsii). The Dune Gentian is rare and the subject of various studies both in Wales and in Scotland, where it has also been recorded; it sometimes occurs with the more common Autumn Gentian (Gentianella amarella) and it is possible that there is some degree of hybridisation between these two species. Petalwort is a small and delicate liverwort that grows only in damp depressions, and this habitat is found in the dune slacks at Whiteford (and also at Kenfig NNR). The slacks between the dunes are completely submerged during winter and spring and gradually dry out during the summer, but they retain sufficient moisture throughout the year for these plants to survive. Another plant that requires this kind of habitat is the Marsh Helleborine (Epipactis palustris); this orchid also thrives in some of the other coastal reserves in Wales. Particularly large populations can be found at Kenfig NNR and Whiteford NNR in South Wales and at Newborough Warren NNR on Anglesey, North Wales where in good years the ground is carpeted with these lovely wildflowers in July. The abundance of wildflowers at Whiteford NNR make is a very good place also for butterflies and other insects that depend on wildflowers for their survival. Look out for the Common Blue (Polyommatus icarus), the Small Blue (Cupido minimus), the Dark Green Fritillary (Argynnis aglaja) and the Grayling (Hypparchia semele) butterflies. The Scarlet Tiger Moth (Callimorpha dominula) can be seen flying during the day at Whiteford Burrows in June and July; this is one of the few tiger moths that has developed mouth-parts enabling it to feed on nectar, and it favours the damp dune slacks found at Whiteford NNR. The Scarlet Tiger Moth feeds on various flowering plants, but particularly Comfrey. Another rare invertebrate found on this nature reserve is the Narrow-mouthed Whorl Snail (Vertigo angustior). Not much is known about this small snail except that it lives in damp, short grassland and probably feeds on micro-fungi that are found oin decaying plants. Whiteford Burrows contains the UK's largest known population of this rare snail. The rocky shore has its own wildlife specialites, too. There is underwater flowering Eelgrass (Zostera sp. ), various types of algae, and boring into the rocks themselves is the Common Piddock (Pholas dactylus). The mudflats and saltmarsh habitats at Whiteford NNR make it a very important wintering area for wildfowl and wading birds. Some of the species that you can expect to see there, along with a number of other seabirds, include Oystercatchers (Haematopus ostralegus), Curlews (Numenius arquata), Lapwings (Vanellus vanellus), Redshanks (Tringa totanus) and Snipe (Gallinago gallinago). In the reedbeds there are also Reed Warblers (Acrocephalus scripaceus), Sedge Warblers (Acrocephalus Schoenobaenus) and Reed Buntings (Emberiza schoeniclus).